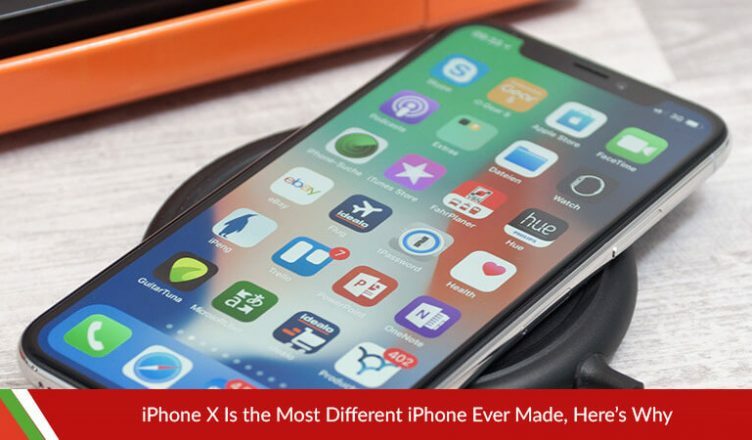 There is no doubt that in the history of iPhones, the iPhone X is a huge milestone. Sure it has the Apple logo on the back and the homescreen looks like an iPhone homescreen, but for the past 3-4 generations, none of the iPhones felt “new”. It all felt like each succeeding iPhone after the iPhone 6 was the same thing repackaged and bought. The iPhone X breaks away from all of this. For once in a long time, the iPhone feels all new again with it’s shiny new hardware, it’s bezel-less screen, the vertical camera and the notch on the front. And it just doesn’t look new, it also works new too. There is a sort of a learning curve here and even if you’re a life -long iPhone user, you’re going to have to adapt into this new skin. Probably the biggest change in the iPhone to come this year is that notch in the front of the display. There are two types of people and their reactions when it comes to the notch. One says that the notch is ugly and that it shouldn’t have ever been there. The other says that, after some days of use, they barely even noticed it. Apple’s approach to these responses are in pure stubborn Apple form: “embrace it”. In the new generation of phones coming out this year, bezels have become a thing of the past. The Samsung phones have the smallest bezels this year but they still make room on the forehead on the phone for the camera and all the sensors that go along with it. The Essential phone cuts out all bezels even from the forehead and some phones even put the sensors on the chin of the iPhone. Apple’s way around this was to make a notch to include all the sensors and front camera and the FaceID sensors that are so different about this new generation. Some apps that come with the iPhone X are optimized to the display. Developers will have to make huge changes to their apps to suit the iPhone x since not only do they have to cater to the notch and make use of it somehow, the iPhone X has a taller aspect ratio. You will see with some apps such as Twitter, how they make use of the notch and wrap around it whereas with Spotify, the app hasn’t updated to cater the new iPhone, so it has a smaller, “square” aspect ratio. Another detail of the notch is watching videos on Youtube or any media source. Youtube videos will fit the entire screen even accommodating the notch, but now it will just look like a piece of the video is missing. And it is. Apple’s solution to it is to double tap the screen to make it smaller again; “square”. Does this defeat the purpose of the bezel-less screen? Yes. Does this defeat the purpose of the notch? Not quite, since the notch is to cater to the Face ID sensors and what not, but it is still an inconvenience for the screen. The iPhone X’s screen also is the most different screen that’s come to an iPhone. The iPhone X now sports what Apple is now calling a “Super Retina Display” which really is a fancy name for an OLED display. It’s a pretty good panel. 5.8” panel, high pixel density, it supports HDR, true tone and all that jazz. It doesn’t get as bright or saturated as Samsung display, which isn’t a bad thing at all. The screen is where the learning curve gets a little steep. The new bezel-less screen didn’t come without sacrifices. The home button on the iPhone is no more and has been replaces by gestures. Rest in Piece iPhone home button. You were a good friend. Although the home button, something so iconic about the phone is gone, it isn’t all that hard to get used to the home ‘bar’ (which is on-screen) and the gestures. Sure, another learning curve but these buttons are really intuitive. The sacrifice of the home button was not in vain, as means of security and clearance have been replaced by the Face- ID. Face ID is…pretty good most of the time BUT, not as close to perfect as the fingerprint reader was. If TouchID was 99% accurate, FaceID is 95% accurate. But obviously over time with software updates and once millions of people get the phone, it will get better. One thing you might have noticed while using TouchID is that it had some minor limitations such as when your hands were wet or had dirt on them or if you were wearing gloves, you’d need a passcode. There will be the same type of limitations with the iPhone X. How FaceID works by using an infrared sensor, not the front camera. It maps thousands of tiny dots on your face to create a sort of ‘digital mask’ of your face. So no, it can’t be fooled by a picture of you since it also checks for depth. It also accounts for changes on your face, say with a beard or make-up, it’ll recognize it’s you. The caveat is using it outside, and that too in few and far between occasions. Infrared red coming from the sun outside might interfere with the phone’s own Infrared blaster. And wearing sunglasses might also be sort of a caveat, since the infrared rays might not get through the glasses. There’s even some settings called Attention lock where it won’t just unlock if you’re holding your phone upto your face, say to check notifications. You have to be looking directly at your phone. Just as a little tease to anyone who doesn’t have an iPhone X, an feature called “Anemoji” is included in the iPhone X where it tracks your face and records emojis according to your expressions and you can send it to everyone. Here’s the thing though, the Anemoji feature doesn’t even require the Face ID sensors, just the camera, so really, it could have been on any iPhone, but Apple is Apple. XNSPY will be compatible with all updated of the iPhone X!